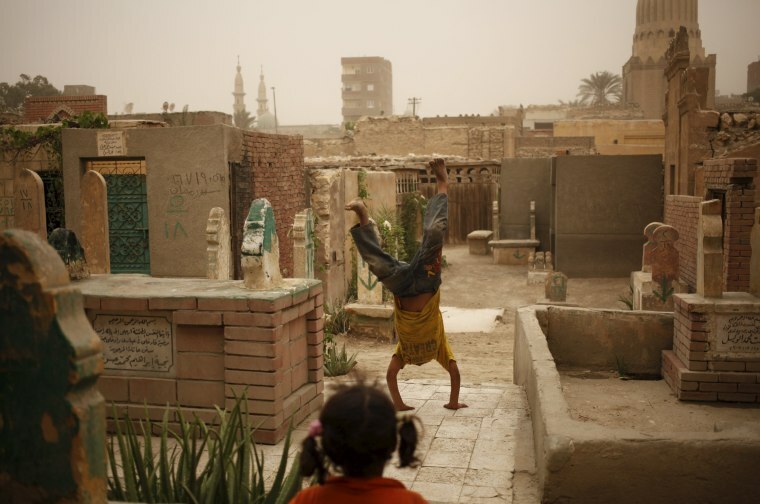 In the sprawling Cairo Necropolis, known as the City of the Dead, life and death exist side by side. 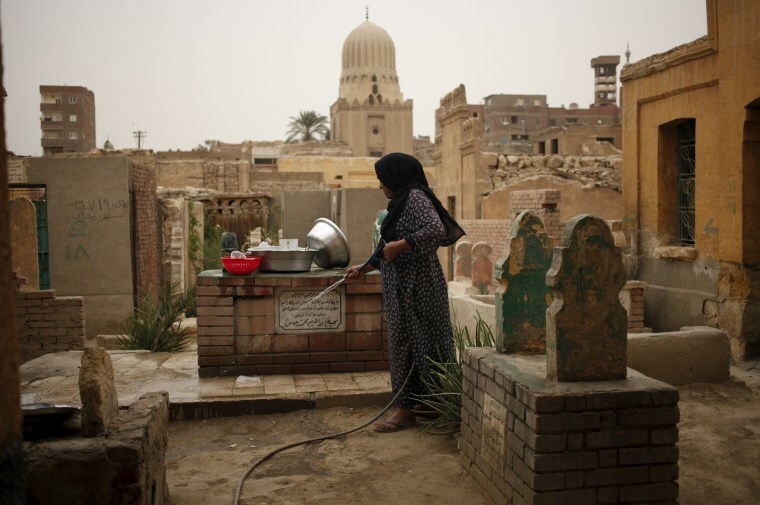 A woman who lives in the Cairo Necropolis cleans a tomb, outside her home, on Oct. 23, 2015. 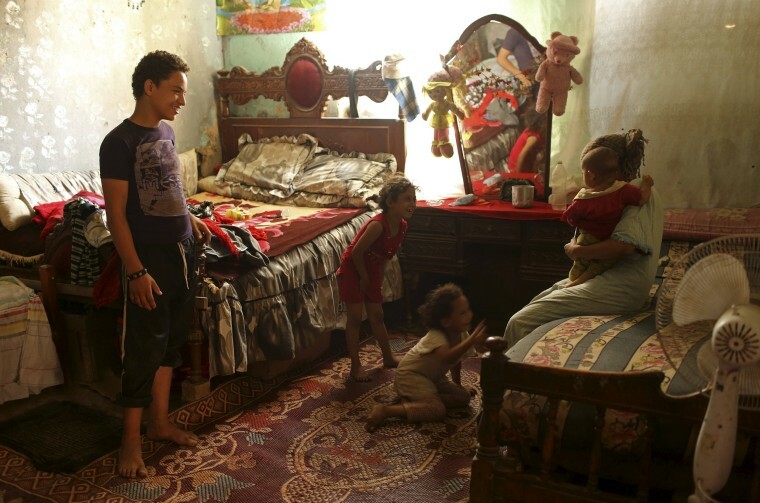 Amid a housing crisis in Egypt, and with the population of the capital estimated at 20 million, thousands of people count themselves lucky to call this their home. 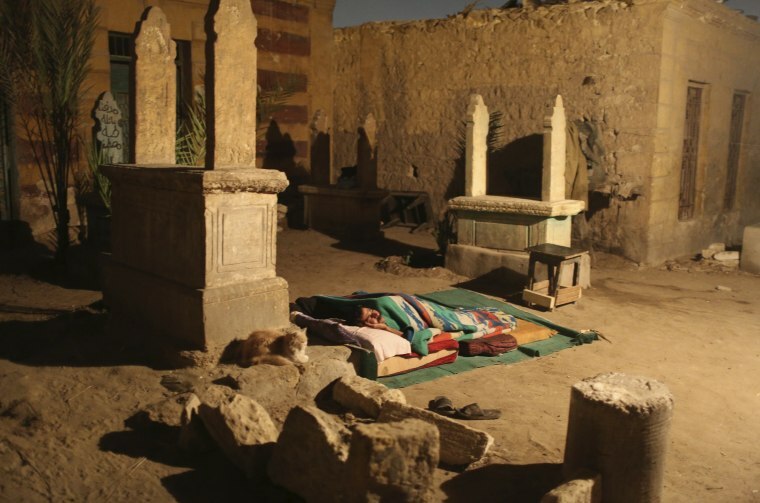 A man sleeps between tombstones in front of his single-room home on a hot night on Oct.13, 2015. Some families have lived here for three or more generations. A resident watches as people carry a coffin on Oct. 16, 2015. 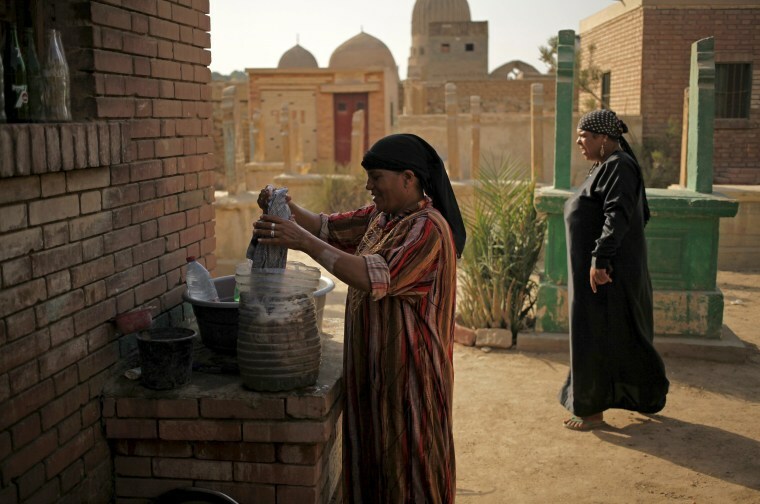 For some in the neighborhood of cemeteries, the graves themselves provide a livelihood: taking care of tombs, digging new graves, or selling flowers to visitors paying their respects on Fridays. 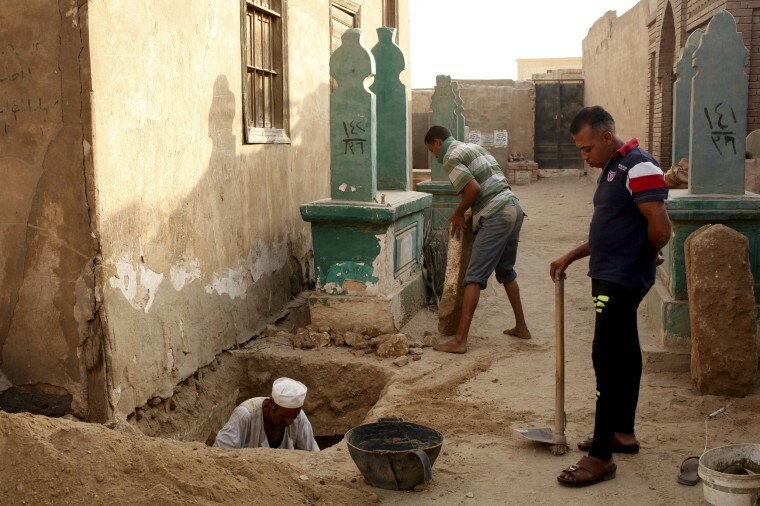 A caretaker digs a grave in preparation for a burial on Sept. 13, 2015. 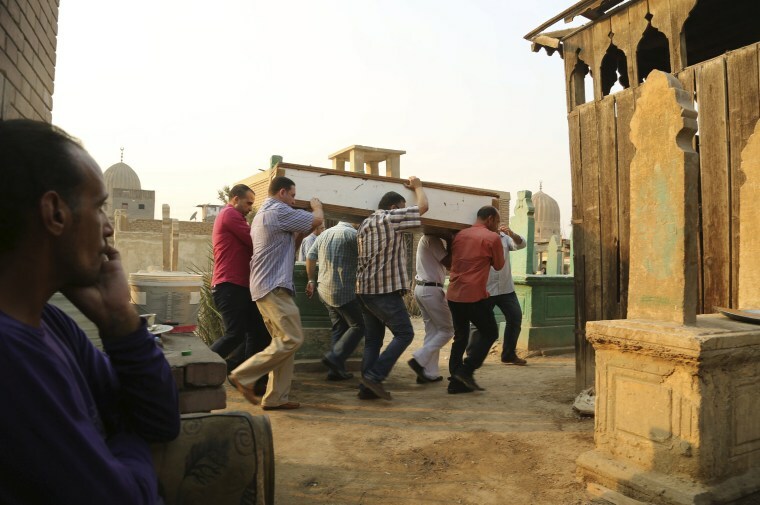 A caretaker typically gets 150 Egyptian pounds ($19) for each new grave dug for poor families, and between 400 and 500 Egyptian pounds from richer customers, residents say. Of that, the gravedigger then receives between 50 to 70 Egyptian pounds. 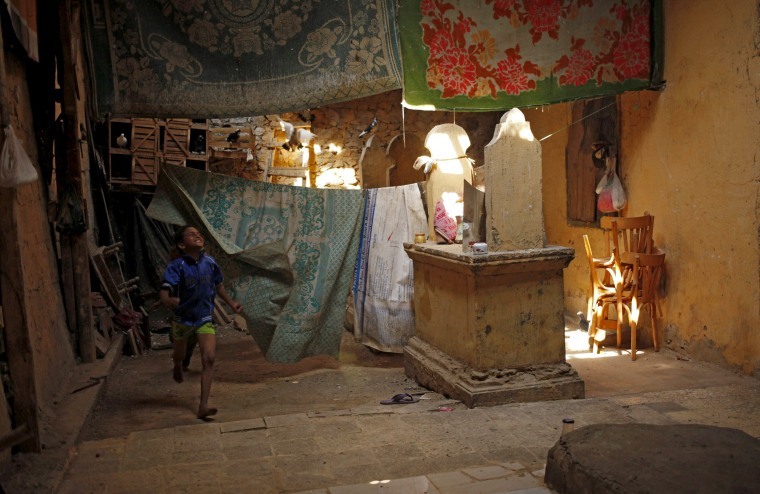 A woman washes clothes in front of the small room where she lives in the cemetery on Sept. 13, 2015. "Living with the dead is very easy and comfortable," says Nassra Muhamed Ali, 47, right. "It's the people who are living who harm you." Nassra, who lives there with her two brothers and 16-year-old daughter, says the relative peace and quiet of the area has its downsides. Some from outside the neighborhood use the graves to deal drugs, with theft also being an issue, she says. 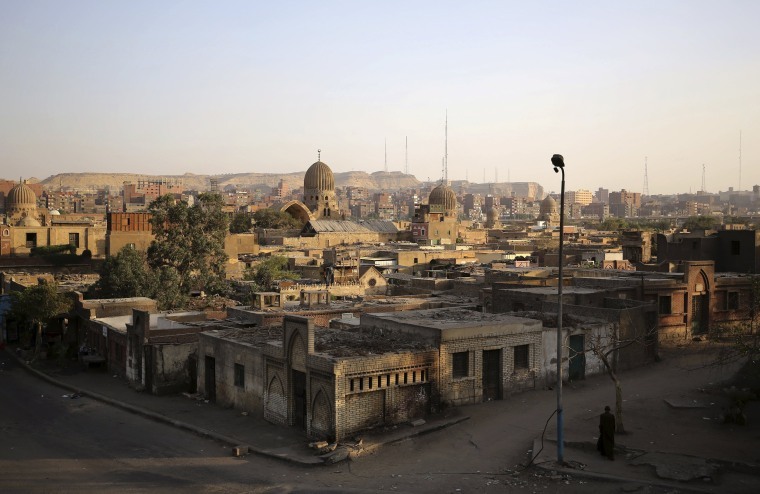 A general view of the Cairo Necropolis, Egypt, on Oct. 14, 2015. 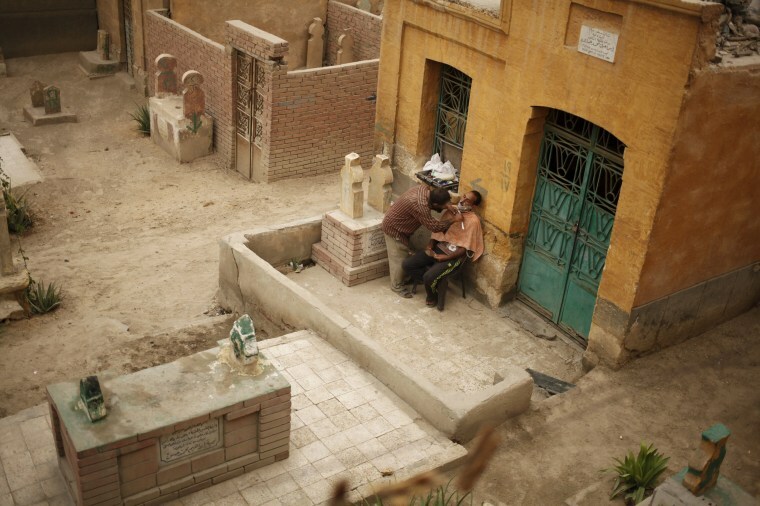 It's the oldest burial site in the city, dating back as far as 1,000 years, near the Al-Azhar Mosque. 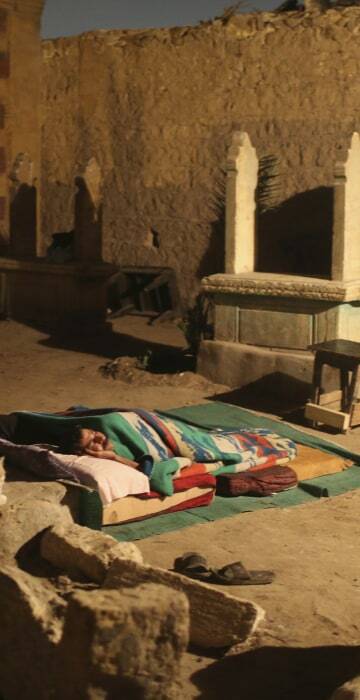 Those buried there include famous actors, among them Farid al-Atrash and his sister Asmahan, who appeared in Egyptian movies until the 1960s. A family interact in their home on Sept. 14, 2015. A child runs past a tombstone on Sept. 4, 2015. The neighborhood is a final resting place to hundreds of thousands of people, buried there over centuries. 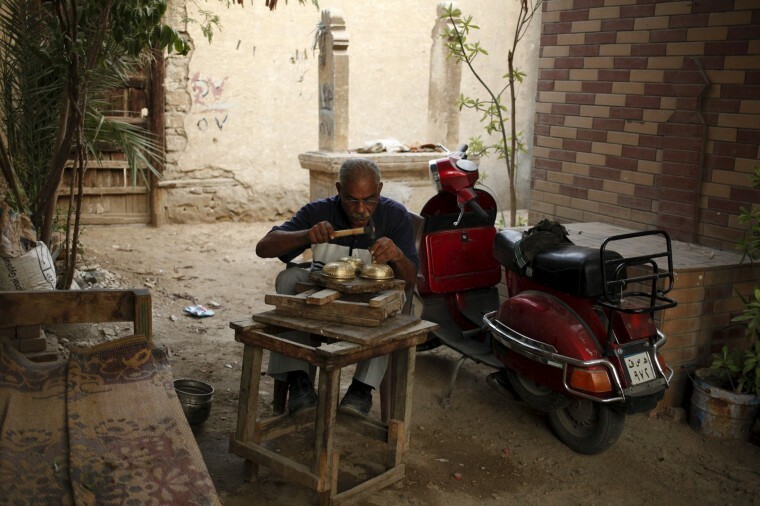 A man works in an alley on Sept. 17, 2015. 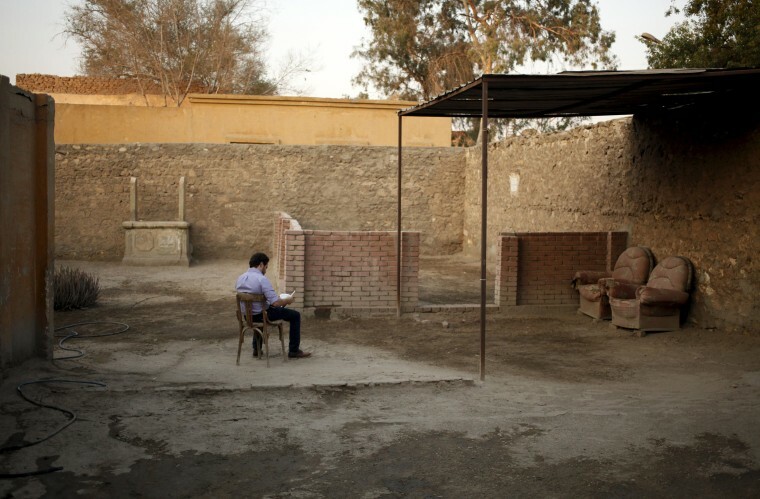 A man reads the Koran in front of his father's tomb on Sept. 17, 2015. 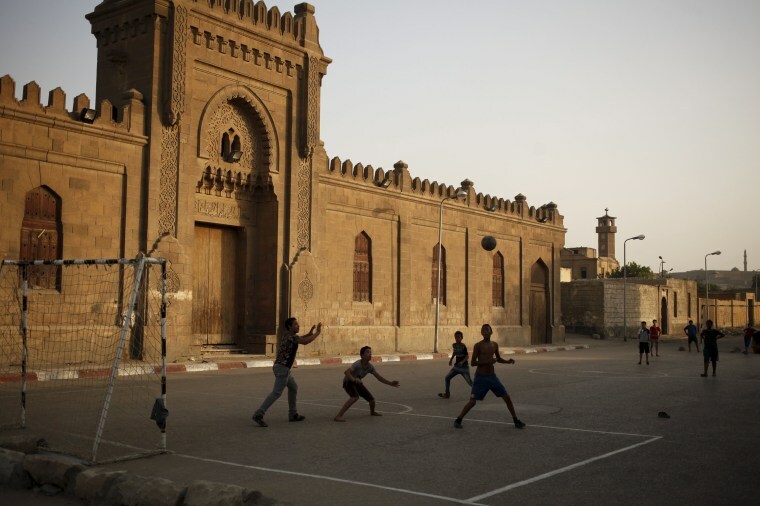 Children Play soccer next to ancient tombs on Sept. 13, 2015. A barber shaves a man Oct. 23, 2015. The cemeteries also bring in money for vendors catering to those who live there. Among them are a man selling fresh vegetables from his horse and cart, and a man on a motorbike who sells milk. A boy plays near tombstones on Oct 23, 2015. Residents talk in an alley on Sept. 14, 2015. 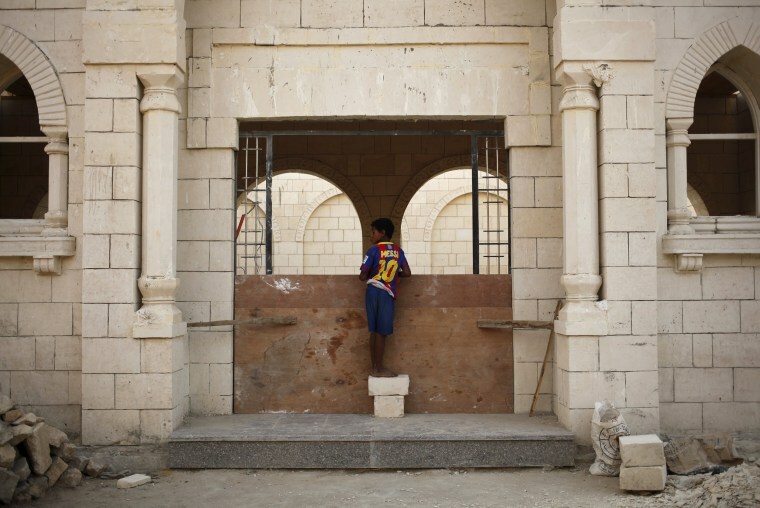 A boy watches a new graveyard being constructed in an alley on Sept.13, 2015.